Dynamic Conveyor Corp. offers an allergen kit to accompany its DynaClean® sanitary conveyors. They are designed to prevent product cross-contamination following product changeovers. Allergen Kits are ideal for companies who prefer to use the same conveyor system to process a variety of different types of products where cross-contamination is a concern. 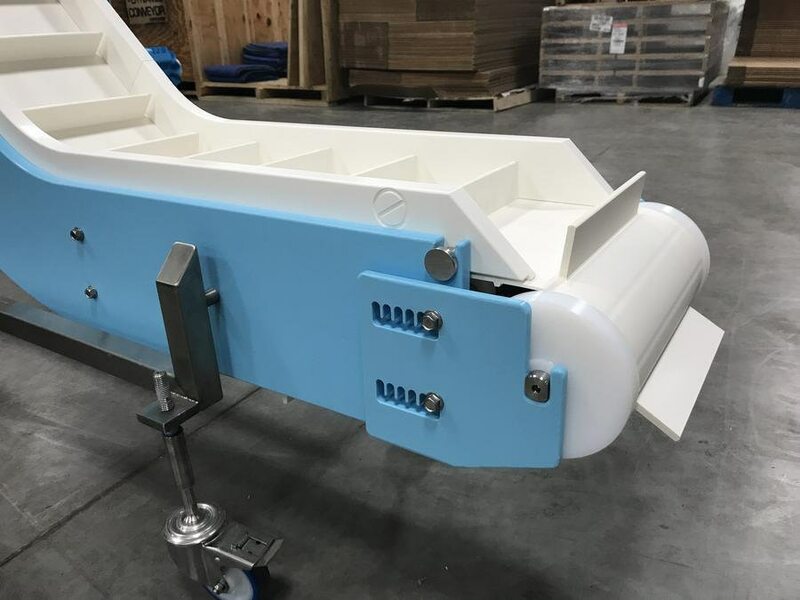 Processors who convey products that include common allergens such as milk, eggs, nuts, soy, wheat, fish, and shellfish will benefit by utilizing a DynaClean conveyor with an Allergen Kit. With an Allergen Kit, customers are able to simply swap out the conveyor components that are in the product stream and eliminate the potential for cross-contamination. For easy identification, Allergen Kits include a white conveyor belt (instead of the standard blue), removable retaining walls and optional clear covers branded with an allergen identifier of choice. Utilizing an Allergen Kit eliminates the need for an extra conveyor allocated for conveying specific products only. The Allergen Kit compliments the easy to clean design of the DynaClean conveyor. The patented design of the conveyor system allows for simple, quick and easy disassembly and cleaning. There are no tools needed, no small parts to lose and no nooks and crannies to clean. With the DynaClean conveyor, processors experience an ultra-sanitary conveyor option that reduces cleaning time from hours to minutes.